While there more than 35 species of rockfish that call Alaska home, Kodiak Jig Seafood focuses on two pelagic varieties, black (Sebastes melonops) and dusky (Sebastes variabilis). These species have exceptionally high reproductive rates, making for a strong and resilient stock and a great target for the sustainably minded jig fisherman. In this way, these rockfish differ from their bottom-dwelling cousins such as the yelloweye rockfish, which have slow reproduction rates, are long-lived, and more easily depleted. 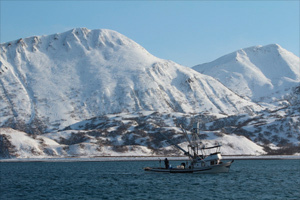 Rockfish in Alaska are caught with several gear types from trawls to longlines, and handlines or jig gear. Hence, when it comes to rockfish, it’s important to know which species you are eating, and how it was caught. Kodiak Jig Seafoods can provide the assurance needed to serve and eat rockfish you can feel confident about. Handline-caught black rockfish has a “Best Choice” rating by the Monterey Bay Aqaurium’s Seafood Watch program. You won’t just feel good about eating rockfish from Kodiak Jig Seafoods, your meal will taste good too! Black and dusky rockfish have a firm, flaky texture and do well in the oven, the frying pan, or on the grill. From fish tacos to seafood stews, this beautiful whitefish is sure to please all of the senses.